Fluffy couldn't get to sleep a couple of nights ago, so he went into a guest bedroom and watched a movie in the hopes that it would bore him to sleep. He never got back to sleep, but he did enjoy the movie. Its title was A Sound of Thunder and it was based on a science fiction story by Ray Bradbury with the same title that was published before we were in nursery school. It may have been an old story, but it was a good one. The next morning as he was helping me with my morning exercises, he mentioned the movie to me, and I immediately asked him if it was the one about stepping on a butterfly. He confirmed that indeed that was the story in question. The story takes place in a future time when time travel has been perfected, and a company offers to take people back to an earlier time to allow them to shoot a dinosaur. Because changes to the past could affect the future, the company takes great pains to make sure nothing will be changed by these hunting expeditions. The hunters can only shoot a particular dinosaur just before it is about to die anyway (by being trapped in a tar pit or covered by an erupting volcano), to ensure that killing the dinosaur 15 seconds earlier will not alter history. The company also provides an elevated path above the jungle floor, and everyone has to stay on that path. Plus the hunters use ice bullets that melt and leave no metal residue behind. The organizers of the expedition believe they have covered all the bases. But on one occasion there is a mishap, and one of the hunters steps off the path and crushes a butterfly under his boot. The owners of the hunting expedition hope that such a minor accident will have minimal effects, but when they return to the future, they find that the whole world is different. In the short story, the changes were political in nature (the world they returned to was now under the influence of communism, as befitting our own world’s obsession with communism in those Cold War days when the story was written). In the movie, the changes were environmental, also befitting the times in which we live. The weather was warmer, and plants were more aggressive, growing up through concrete and seeking out humans as potential food sources. Different types of animals had also developed (a cross between a dinosaur and a gorilla, for example), which were also predatory towards humans. At the end of the movie, the heroes go back and prevent the butterfly from being killed, thus allowing the future to unfold as expected. The moral of the story is that seemingly unimportant actions may have dramatic and long-lasting consequences. This reminded me of a Relief Society lesson that we had a year or so ago. The teacher asked us to think back to an experience where someone did something that changed our lives, and then to share that experience with the class. She was no doubt gratified to see that there were more women willing to share experiences than time would allow. In fact, the people who shared their experiences went on like a chain. In an entirely unplanned sequence, each woman who stood up said that her life had been positively influenced by the woman who had stood up and given thanks immediately before her. Each one gave specific examples, so we had a chain of gratitude that filled the hour. It was an impressive lesson that I will not soon forget. Who knew that there were so many instances of our actions having such long-lasting effects? There was another incident that hit closer to home. Back when the Relief Society used to have craft classes, I drafted Fluffy to teach a class in how to make stained glass hearts. A whole bunch of women signed up, and each of them made one of several varieties of hearts to take home and hang in their windows. Fluffy and I still have two of them hanging in our kitchen, all these many years later. 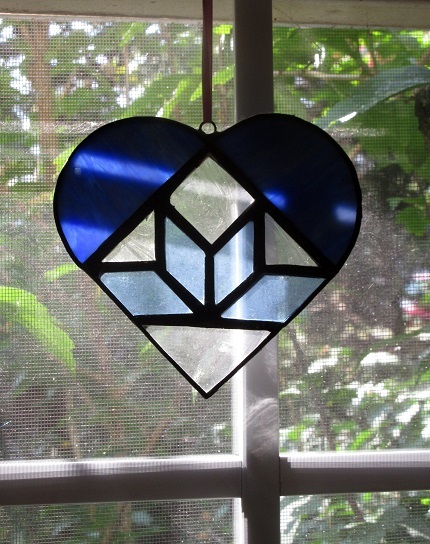 The heart suncatcher we made in Relief Society craft class. Months after teaching the class, Fluffy needed to go to the stained glass store to purchase some supplies. When he got to the store, fifteen miles away, who should be standing behind the counter but one of the women who had been in his class? When Fluffy asked her what she was doing there, she said she had enjoyed the class so much that she had gone to the stained glass store for more lessons. Then she had abandoned her career and gotten a job at the stained glass store so she could spend all her professional time pursuing this newly-discovered passion. This was a real surprise. I don’t remember specifically what Brook used to do, but was one of those women who was a high-powered corporate executive. She was married to her job. She wore a suit to work and gave presentations, getting home to her daughter at all hours of the night. Now, all these years later, her Facebook page says she does “Custom Glass Art Work & Architectural Glass Commissions." This was a big jump for her, and it was precipitated by a small thing. Fluffy had no idea when he gave that little class that he was completely changing somebody’s life. He threw a small stone in a pond, and it resulted in ripples that went far beyond what we could imagine. As we sail through life (or, in my case, blunder through it), we have the opportunity to help others along the way or to step on a lot of butterflies. Sometimes I think I spend my life in army boots, tromping on the tender feelings of others. Oh, I do not do it on purpose! But as my feet move at little old lady speed, my tongue goes at eighty miles an hour. The memory of that old Ray Bradbury story was a good reminder that even the most casual word we say has an impact, and that every action is being watched — and all too often imitated — by others.